Located at 1,000 feet on the cool northwestern shoulder (Bennett Valley side) of Sonoma Mountain, the Belden Barns site has a long history of farming dating back to the late 1800s. Dave Steiner, one of the first to plant wine grapes on Sonoma Mountain, established the estate vineyard in the early 1970s. He originally planted Cabernet Sauvignon, but over time the site proved too cool to consistently produce high quality Cabernet Sauvignon. Rod Berglund of Joseph Swan convinced Steiner to plant Pinot Noir instead. As a result, Steiner Vineyard became a source of Pinot Noir beginning in the early 1990s. The current owners, Nate and Lauren Belden, acquired the site in 2005, and began re-developing the vineyard to bring it back to historic standards. About 10 of the original 30 acres under vine are still standing, but most vines were virused and impacted by phylloxera. The new owners were able to save a 1.5-acre block of Pinot Noir clone 667 planted in 1998. The remainder of the 19.5 acres developed to date are planted to Pinot Noir, Syrah, Grenache, Grüner Veltliner, Chardonnay, Sauvignon Blanc and Viognier. Fruit is sold to Argot, Carlisle, Cold Heaven, Donelan Family, Eric Kent, Holdredge, Morgado, Smith Story and vineyard designated. 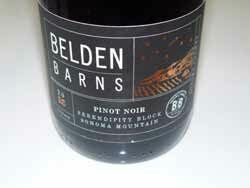 The Belden Barns label was launched in the summer of 2014 with the release of estate grown wines from the 2012 vintage. Chris Bowland is the vineyard manager and Justin Harmon is the winemaker. Current offerings include several varietals including an Estate Pinot Noir and Serendipity Block Pinot Noir. The centerpiece of the Belden Barns logo is a wishing tree inspired by wishes hung in the estate's oak tree by Lauren and Nate's friends on their wedding day. The label is formed in the shape of a wish tag and the word "Wish" is hidden in the branches of the tree, inspired by the winery's tag line, "Wish Big." A number of Golden Corks are included in each vintage with these corks providing a Willy Wonka-like surprise for those lucky enough to happen upon one. The Belden Barns wines have been placed on the wine lists of a number of highly respected Bay Area restaurants and have won medals in wine competitions.